Now available from KRSS, a used fully refurbished and serviced Thermo Exactive Orbitrap Mass Spectrometer with Accela Pump 600, Accela Autosampler (incorporated Column Heater), HESI Source, Syringe Pump, Rheodyne Diverter Valve, Sogevac SV40BI Vacuum Pump, Computer, Monitor, 3 months warranty, installation and training. The Exactive is a high-resolution benchtop liquid chromatography-mass spectrometry (LC/MS) system designed for simple and complex screening in a range of applications, including petrochemical, drug discovery, clinical/toxicology, environmental and pharmaceutical. The Exactive provides precise and reliable detection and identification of compounds in complex mixtures, setting a new standard for LC/MS performance at resolutions of up to 100,000. It is also fast and cost-effective to operate, while maintaining full compatibility with U-HPLC and fast chromatography. 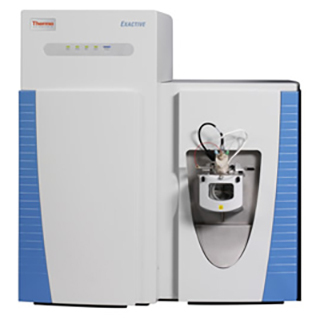 The Exactive was the first benchtop mass spectrometer based on revolutionary Orbitrap technology, the recognized standard for accurate mass and high-resolution measurement. The high resolving power, mass accuracy and dynamic range of Orbitrap technology allows rigorous characterization of complex mixtures. The Exactive is the first mass spectrometry system to make advanced Orbitrap technology accessible to both non-expert users and experienced mass spectrometrists.